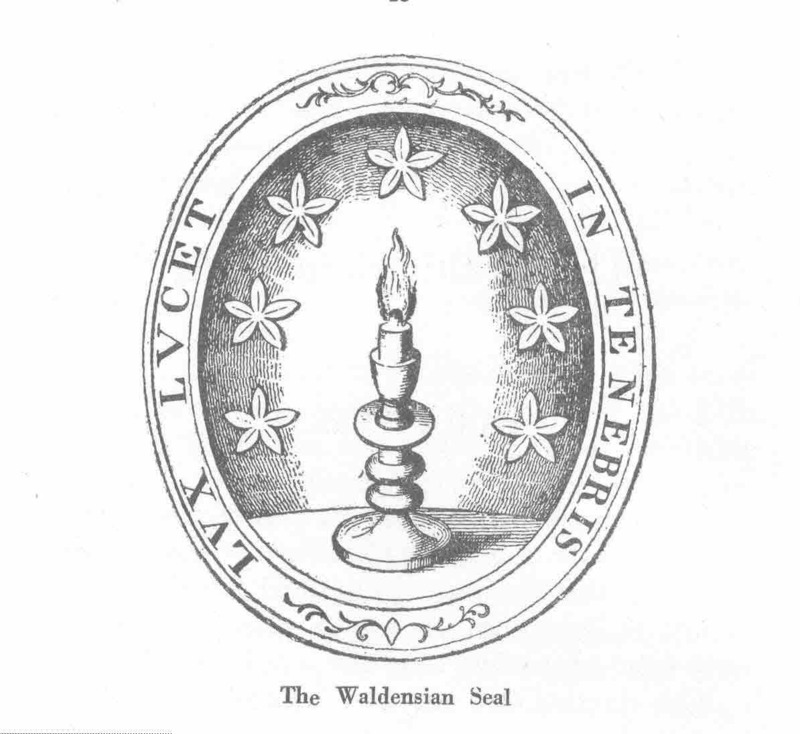 traditionally the Waldensians separated from the Roman Catholic Church. agreed by the synod at Chamforans on 12 October 1532. “O Brethren, give ear to a noble lesson. For we see the world nigh to a conclusion. Seeing that the end of this world approacheth. Since it was written thus, for we are in the last time. And that in the increase of evil, and decrease of good. As also, that no man living can know the end. Whether we shall die to day or tomorrow. Every one shall receive their full reward. Those that shall have done either well or ill.
That all men shall pass two ways. The good to glory, and the wicked to torment. That few are the saved in comparison of the rest. The honour of God the Father ought to be his first moving principle. And the Holy Ghost which lightens us in the true way. Full of power wisdom and goodness. And our neighbour, for God hath commanded it. Not only those that do us good, but those also which harm us. That in the end He may receive us into His glorious habitation. Shall never enter into this house. But rather hinder them to the utmost of their power. How came this evil to enter into mankind? By eating of the forbidden Apple. However Christ has redeemed the good by his death and passion. Rejection of images and relics. And believe in Idols to their own Destruction. Which God put into the heart of that man whom he first formed. But commanding him to do the good, and eschew the evil. And had his hope in the Lord, and not in any Creature. We have sinned against the Creator, and offended the creature. There being none to be found in the holy Scriptures. And have peace with his Brethren, and love all other persons. And if he did the contrary, that he should be punished. And served the Body more than the Spirit. Wherefore we find that many have perished. But let everyone take heed, that it happeneth to him, as it did to them. But God caused an Ark to be made, in which He saved the good. That in all the world there were saved but eight persons. To keep ourselves from evil, and that all ought to repent. That all those shall perish that shall not do so. and they believing it were multiplied. That they did not thoroughly believe the Words of the Lord. but alas they could not accomplish their design. the which also He then demonstrated. And now it is called confusion, by reason of its ruinous condition. That so they might not finish what they had began. The which Languages then spread throughout all the World. Being sentenced by God, to fire and brimstone. For the Woman looked back, breaking the command. That they ought to take heed of that which God forbids. And delivered His People and destroyed the other Nations. Which they found written, and nobly ordained. Promising to those that kept it, the heavenly Kingdom. The Earth opening and hell receiving them. Which fought for the faith, and defended the same. There was one only People chosen by God out of all the World. They died, were destroyed, and taken Captives by those other Nations. And that feared to offend their King. Only that the World might see it, and to be the more honoured. But little worth is this honour which soon vanisheth. Belief in the Virgin Birth. For all mankind was in the way of perdition. He shall save his People from their sins. Pure was this Virgin and Joseph also. They wrapt Him in swaddling clothes, and lodg’d Him but very meanly. Which never cease to heap up Riches together. In the East appeared a Star to the three Wise Men. Glory was given to God on high, and on earth peace to the good. And what God hath joined let no man separate. And that thy speech be no more than yea and Nay. But leave thy vengeance to thy heavenly King. And then shalt thou find pardon with the heavenly King. That ye may be the Children of your Father which is in Heaven. For if thou dost not pardon, thou shalt not be saved. Nor despise the stranger which cometh from far. For in this World we are all Pilgrims. Thus all we that are Brethren ought to serve God. And this is the new Law which Jesus Christ saith we ought to keep. To love one another, and to be at peace. How he ought to die, and afterward rise again. they likewise gave him Gall and Vinegar to drink. Belief in Justification by Faith. And then they remembered what he had said. And baptized those who believed in the Name of Jesus Christ. They were called Christians, for they believed in Christ. That the Jews and Saracens persecuted them grievously. And the Men and Women which were with them. Whatsoever should come of it, so that they might have Jesus Christ. Only because they taught the way of Jesus Christ. Which men ought to be Christians, but appear not to be such. That the Saints persecuted or imprisoned any. Who taught the way of Jesus Christ our Saviour. And let those live quietly who are false Deceivers. For they love not the Sheep, but only for their Fleeces. he must needs love God, and Jesus Christ. To take from him that which he has gotten by his just labour. This they say is a good man, and to be accounted faithfull. What shall he leave his Children, and what will the World say? And telling him that he is very well absolved. And he that maketh him believe it sinneth mortally. ‘Tis God alone who pardons, and no other. Viz. by declaring that they ought to repent. We must keep this way. And thus we may overcome our Enemies. Viz. to know God, and to pray to his Creatour. For, they were damned that would not do it. For he condemneth and punisheth every one that offends. That he may repent in this present life. As for any other Law to come after we shall have none. And to be well forewarned when Antichrist shall come. Now according to the Scripture, there are already many Antichrists. For, all those which are contrary to Christ, are Antichrists. The Heaven and the Earth shall burn, and all the Living die. And all Buildings shall be laid flat. For you shall be damned without remedy. Where you shall have Pleasure, Riches and Honour. That we may be of the number of his Elect to dwell in his Court for ever.